In addition to some pretty rad dried strawberries, Gourmet Nuts and Dried Fruit also provided me a five pound bag of raw cashews to play around with. Naturally, I made cheesy pasta! 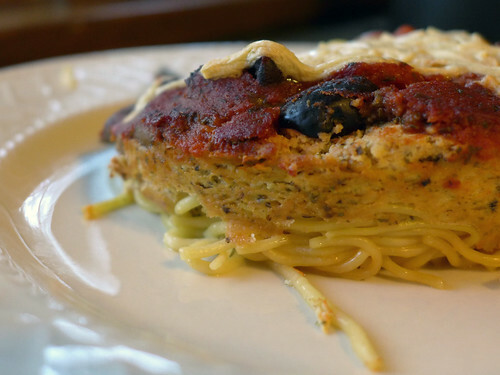 So I was first introduced to the concept of Spaghetti Pie by Tami Noyes, by way of her most excellent cookbook, American Vegan Kitchen. (Seriously, this is one of a handful of cookbooks that I can’t recommend highly enough.) Since then, I’ve encountered variations on this theme in a number of places. (See, e.g., Bake and Destroy by Natalie Slater.) Over time, I’ve plucked elements from each recipe and smooshed and mashed and cobbled them together to create a version that’s a) easy; b) mostly sticks to ingredients that I’m likely to have on hand; and c) is still super freaking delicious. 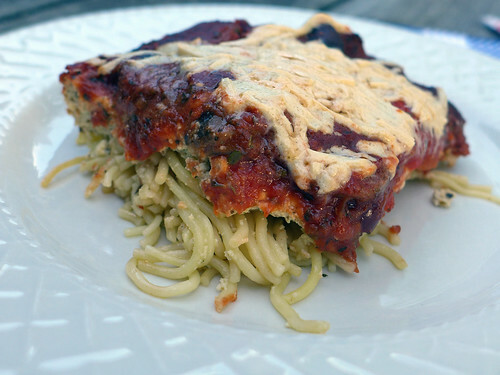 Spaghetti pie (or cake, or whatever you want to call it) typically has a bottom layer of pasta (either plain or lightly coated with sauce), followed by a tofu-based, ricotta-like cheese (this is where the cashews come in! 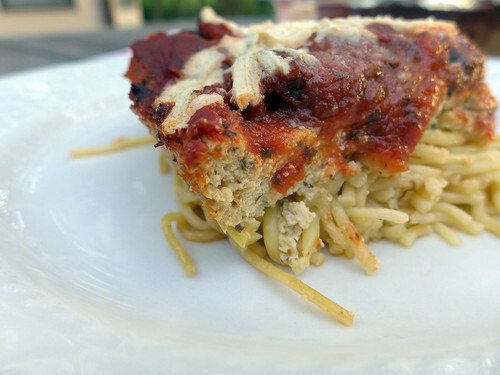 ), and then topped with pasta sauce and either vegan mozzarella cheese or some other bake-able topping, such as breadcrumbs mixed with nutritional yeast. You can get as complicated as you want; for example, by hand-roasting red peppers and then simmering them in your own special red sauce for a full day beforehand. One of my favorite things about this recipe is its versatility: sure, you can go all gourmet when time allows – but if you’re in a pinch, swapping out the special sauce for store-bought stuff saves time time without sacrificing quality (well, not too much, anyway). 1. Preheat the oven to 350F. 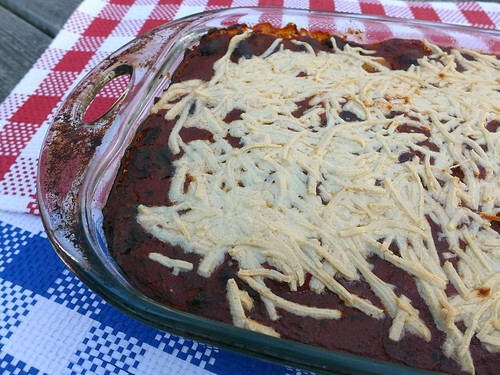 Lightly coat a 9″x13″ glass baking pan with non-stick cooking spray. 2. Begin by preparing the pasta. Bring a large pot of water to boil. Add a pinch of salt and a bit of olive oil to prevent the past from sticking (and also because you’re just gonna add more later!). Cook the pasta according to the directions on the package. When done, drain and toss with a tablespoon of olive oil, taking care to mix it in well. 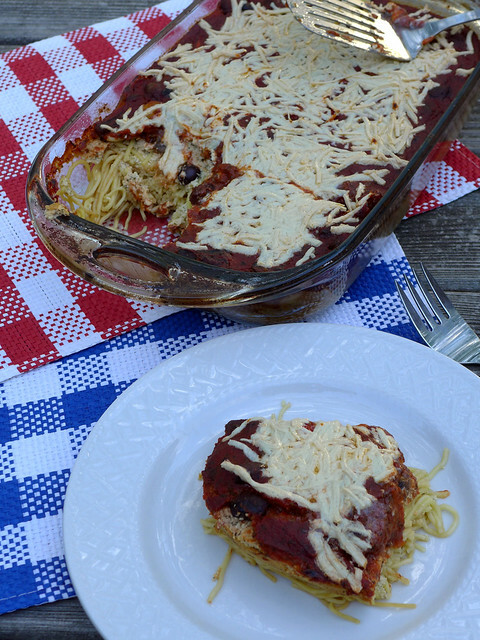 Transfer the pasta to the prepared baking pan and pat down until it’s more or less evenly leveled. 3. Next, make the middle ricotta layer. 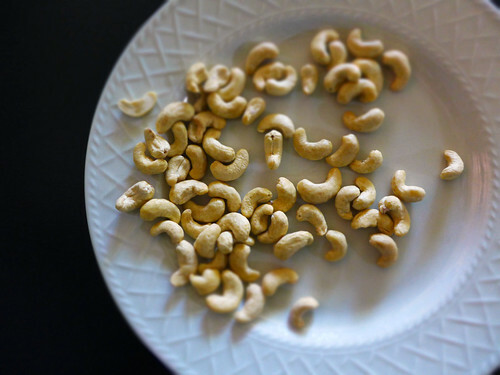 Place the cashews in a food processor and pulse until you fave fine bits. Add the rest of the ingredients and pulse until fully blended, stopping once or twice to scrape the side of the bowl with a rubber spatula. When creamy and seasoned to taste, spread the tofu mix on top of the pasta, patting it down as you go. Lick the bowl like no one’s watching. 4. Open one 24 ounce can of pasta sauce. If desired, combine it with a handful of your favorite veggies. Peppers, mushrooms, and Kalamata olives are all fine choice. Spread the pasta sauce on top of the ricotta mix. Add a second can (or part of one) if desired – but be careful to save enough extra clearance room for the mozzarella, if you’re going this route. 5. Top with several handfuls of vegan mozzarella cheese (Daiya is an excellent choice; Vegan Gourmet by Follow Your Heart is another favorite). Cover with aluminum foil (or a cookie sheet, to save some scratch) and bake at 350F for 30-45 minutes, or until the sauce begins to bubble. If using mozzarella cheese, uncover the dish, transfer to the top rack, and broil on medium for ~60 seconds, to better melt the cheese. Be careful not to burn it! 6. You can serve it immediately, but letting he casserole cool for 5-10 minutes a) makes it a little easier to cut and serve and b) gives the middle ricotta layer a chance to solidify and become more ricotta-like. Optional: This is a great dish to prepare a day or two in advance. Just wrap in aluminum foil and store in the fridge. Remove it about two hours before mealtime, so that the glass pan has time to come to room temperature before going in the oven. Save me a corner piece, it’s my favorite part! This entry was posted on Tuesday, July 4th, 2017 at 7:00 am. You can follow any responses to this entry through the RSS 2.0 feed. You can leave a response, or trackback from your own site.